Greetings to you in the name of Christ Our Lord on this the feast day of Saint Teresa Benedicta of the Cross. Do you know her story? Born Edith Stein, Jewish, Polish, a brilliant scholar of philosophy. She later became Catholic and then became a Carmelite nun. She was sent to Auschwitz by the Nazis in WWII and died in the gas chambers at the age of 51. Her memory stands as a Christ-light undimmed in the midst of evil, darkness, and suffering. “And the light shineth in darkness; and the darkness comprehendeth not." St. Teresa saw the Light in a very dark place. We can only speculate on how she was able to endure her suffering to the very end, but like all martyrs, her focus would have been on Christ who awaited her with open arms at the end of her suffering. Like St. Teresa, we too must focus on the Light which is Christ. In the just cause of Life, we have taken a few battlegrounds. We now have a pro-life president. We have a pro-life Vice President. We are now acquiring another pro-life Supreme Court Justice. We have not won the war. We are still a long way away from winning the war. It is important to mention that it is OUR war. We must own this war. The good thing is that we will win, but we must stay focused on Christ. Stay informed. That’s why you’re here on this page reading this. And here are some things that are happening soon. 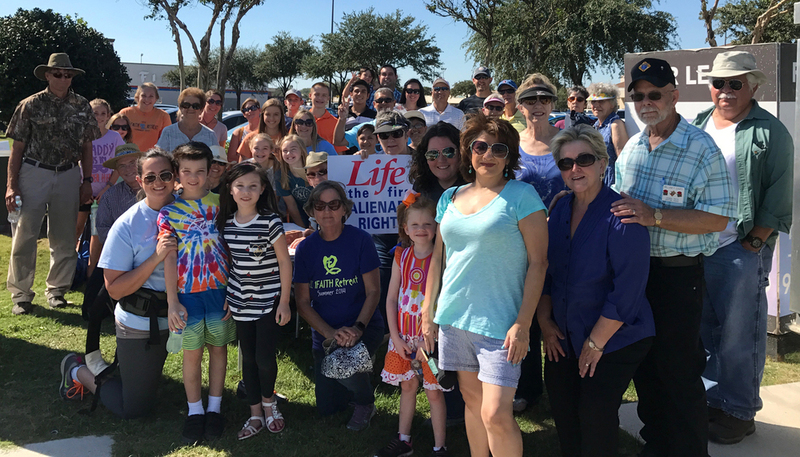 Most importantly, the Denton Life Chain, a peaceful annual prayer and demonstration for cause of life and an end to abortion. This is October 7, 2018 from 2-3:30 beginning at the corner of Carroll and University. Signs are provided. I’ve attached the flyer. Also, Abby Johnson, former Planned Parenthood Director, convert to the prolife cause, convert to Catholicism, dynamic speaker will be speaking on September 28th, 2018 at Respect Life Night at Holy Family Church, 6150 Pershing Ave., Ft. Worth, TX 76107. I’ve attached the flyer. The opening vigil for the 40 Days for Life, Fort Worth is on Wed., Sept. 26th at 7:00 pm in front of Planned Parenthood—6464 John Ryan Dr, Fort Worth. Bishop Olson will probably be at this event as well as other members of Fort Worth’s Catholic and Protestant communities. I have maps available if you’re interested. We also had a discussion about possibly having a Denton 40 Days for Life in the future. Mary’s Angels -- Maria Walters shared with us about an important ministry she helped start at St. Elizabeth Ann Seton in Keller. Through Mary’s Angels, women who have suffered through miscarriage or stillbirth are able to find a community of support, prayer, and other assistance. We would like to expand this ministry under the Respect Life Office and will be working to get approval for this endeavor. We will keep you posted! Randy and Laurie Bollig of Loreto House are in need of volunteers called Faith Companions. You would be on site to help a woman, after her initial counseling if she agrees to speak to a person of faith. This would involve mostly listening and praying with one of these vulnerable women. The Bolligs find that 70% of the women they see are open to this faith meeting and they really need people to be on hand. If you’re interested, please give me your contact info and I’ll have them call you. Lastly, stay focused, pray always and be happy. Jesus was happy. Saint Teresa Benedicta of the Cross was happy. St. Peter said, "Always be ready to give an explanation to anyone who asks you for a reason for your hope." -- 1 Peter 3:15. By the Grace of God and for the purpose of the glory of Jesus Christ, I greet you on this day of the canonization of Mother Teresa, now St. Teresa of Calcutta. It’s been quite a long time since my last entry on the Respect Life page, and that is unfortunate because things have started to pile up and there is so very much to do. I am not like St. Teresa. When I am overwhelmed with the task ahead of me, I tend to procrastinate, maybe go grab a glass of soda, some chips and ah, now it’s time to take a little walk, and then oh, let’s see what’s on Facebook. In contrast I give you St. Teresa. “Well they just kicked me out of the convent. Time to hit the streets and start working, and working, and working.” “But Mother Teresa, you need hundreds of documents and permissions and signatures to start a charity that helps the poor, the sick and the orphans.” Her response was to keep working and praying and loving. “Mother Teresa, you need thousands and thousands of dollars to build a convent, school and hospital.”…work, pray, love. “Mother Teresa, the secular press is trying to bring you to ruin with false accusations.”…work, pray, love. Ok, so I’m not Mother Teresa. Back to reality. Much to do. Here’s my to-do list. 1. Tell you about the Rachel Ministries. Rachel Ministries offers the Rachel’s Vineyard Retreat. This is a weekend retreat for the purpose of healing after an abortion. It is available for women AND men who have been involved in abortion and long for reconciliation and peace. The director is a very loving, easy-going gal who is also post-abortive. They also offer Spanish retreats and non-denominational retreats. For more information, click on the Rachel’s Vineyard link in the sidebar or on the document under "Documents". 2. Let you know about the 40 Days for Life Kickoff Rally. It is a three point program working to end abortion in the United States and now, the world. Bishop Olson will be speaking at our Fort Worth Kickoff Rally. September 28th at 7:00 pm. at the Ft. Worth Planned Parenthood location. 6464 John Ryan Drive. You can sign up for a spot on the prayer and witness schedule online at www.40daysfortworth.com. By the way, I am aware that there is a Planned Parenthood right here in Denton. We have not yet organized efforts to include it in our 40 Days, but you can certainly pray in front of it. Pray in your own home. However you choose to pray, God will hear, and as you know, with God all things are possible. 3. Announce the Life Chain. This is our Denton Event. It will be the easiest for you, requiring only 1.5 hours of your time, although I can assure you, it’s a major thing to plan. All you have to do is show up. Signs will be provided for you. October 2, 2016 starting at 2:00 pm. till 3:30 in Denton, TX, at the Corner of University Drive and Carroll Street. We will gather on the sidewalk in front of Kroger and will spread out along University on both sides of the street. We will be peacefully praying and holding signs that say “Pray to End Abortion”, “Abortion Hurts Women” and other signs proclaiming a truthful, sincere pro-life message. Saturday, October 8, 2016 at 10 am. St. Patrick’s Cathedral, 1206 Throckmorton, Fort Worth, TX 76102. There is an Annual Lock-in for Life All youth in the diocese are welcome. This is an over-night event for teens 8-12th grade to experience pro-life talks, all night fun and celebrating the gift of LIFE! Saturday, November 12th starting at 5:00 pm. That’s it for the year. Then things really start to heat up. Just a brief overview of the beginning months of 2017. 1-23-17 The Respect Life Mass at St. Patrick’s Cathedral - Fort Worth. 1-27-17 The March for Life in Washington. If you can’t go, watch it on EWTN. If you can’t watch it, record it. Use technology. 1-28-17 Rally for Life - Austin. Every year, there’s a delegation from the Fort Worth Diocese attending this. We depart from Elizabeth Ann Seton in Keller. In February, the 40 Days for Life begins again at Lent. It happens twice a year. By the way, I almost forgot to mention, somewhere in November there is this presidential election thing happening. Make sure you are registered to vote and that you do exercise your right to vote, and that you do so with a well-formed conscience. See the sidebar for literature about faithful citizenship. It is comforting to know that a Catholic vote, cast by a voter with a well-formed conscience is always a pro-life vote. Sanctuary of Hope for a Culture of Life has recently changed locations. They are now located at 1100 N. Bonnie Brae Street, Denton, TX. And they are currently doing a capital campaign to raise money to get their new facility up an running. If you’d like to donate money, just click Loreto House in the sidebar and go to the donations tab. I believe they are very close to their goal but they’re not quite there and could use your help. The Diocese of Fort Worth now has Gabriel Angel training available in Spanish! Click the Gabriel Project link in the sidebar for more information. If you read my last article from 2014 (see below), you will know that our Texas Congress made great strides in favor of women’s health and life in our Second Special Legislative Session of 2013. Then earlier this year, June 2016, the U. S. Supreme Court struck down those laws for which we worked and fought so hard. It’s funny, although the present administration is working fiercely against our pro-life progress, we are still seeing abortion mills shutting down across the country. That just goes to show you who’s in charge, now and always, and He doesn’t reside in Washington. But there’s work to do, much work. If you’re wondering, I will be at several, not all of these events. Please talk to me personally about any of them. If only we could all be like St. Teresa and just jump right in...work, pray, love, and leave the rest up to God. Here in Texas, we have just recently made tremendous strides forward in our fight to defend the unborn. Here is what we’ve gained. Also in Texas, despite insurmountable odds, including lawsuits by Planned Parenthood and blackmail by our current federal administration, the governor of Texas signed into law SB 7, a healthcare measure revoking the taxpayer funding of Planned Parenthood abortion mills. Because of this new legislation, one third of all Texas abortion mills have closed. This is very good news, but the fight is not over by any means. There is still much work to be done. Here are some of the challenges that remain. Abortion is still legal in the U.S. on the federal level throughout all 9 months of pregnancy, based not on due process of law but on the Roe v. Wade Supreme Court decision of 1973 which remains very much intact. Abortion is still legal in Texas before 20 weeks. Planned Parenthood, the bloody abortion giant, still has our federal tax dollars backing it, along with a sympathetic following in the secular media and all three branches of our federal government. The HHS Mandate will be implemented in January, a federal government mandate which will further erode our values as Catholics, forcing employers to buy into insurance practices which violate our fundamental religious beliefs about life, contraception and abortifacient drugs. As Catholics, we cannot be satisfied with simply “reducing abortion.” We must work to utterly end abortion, to literally change the culture. As Catholics we must engage social issues with unity and in accord with Church teaching. Do we tend to despair, thinking that Roe v Wade will never be overturned? Or worse yet, have we joined the other side, rationalizing that their cause is sad but just? Do we forget that God is in charge? Ours is not a God of despair. Every pro-life effort we make as a community will be made with love and accompanied by prayer. It is God who will move the mountain called “the culture of death”. It is God who will overturn Roe v Wade. It is God who will heal our land. So what do we do? We practice our faith according to the Catechism, we stay connected to social issues, we vote solidly for pro-life candidates, and we march. Next month (January) is the time for marching. There are local and national marches for Life. I would like to see Immaculate Conception Catholic Church be involved in those marches along with St. Mark parish. Jan 23, 2017 – 7:00 PM St. Patrick’s Cathedral. I will keep you posted on march details by bulletin announcement. If you decide not to actively participate in these marches, at least be aware that they’re going on, spread the word through Facebook, and tune in to KATH 910 AM radio or watch EWTN for coverage of the big one in Washington. Thank you for supporting life. Father, all life is in Your care. You have entrusted us to one another, that we may show our brothers and sisters the same love You have for us. We pray, then, for the least among us, the children in the womb. Protect them from the violence of abortion. Save them from death. Give new hope to their parents, that they may turn away from the desperate act of abortion. Grant conversion to the abortionist and to the staff. Show us how we are to respond to the bloodshed in our midst, and lead us to the day when these places of death will be transformed into havens of life. Guard us with your joy and your peace, for in You, life is victorious. We pray in the name of Jesus Christ, our Lord. Amen.